Windows Explorer seems to have been removed, what do I do? - Ask Leo! Microsoft malicious software removal tool seems to have removed Windows Explorer in my Windows XP. What can I do? I’m actually very skeptical that Windows Explorer has actually been removed. However, there are a couple of steps that I would have you take to diagnose exactly what’s going on and perhaps repair it. To be clear, if your Start menu and taskbar are still visible, then Windows Explorer has not been removed. Besides being the file explorer that you use to look at your own files on the computer, Windows Explorer is also the program that actually displays the Start menu and the taskbar. Perhaps what’s happened is that the shortcut to Windows Explorer has been removed. I can see that happening, although not necessarily as a part of the malicious software removal tool. What I would have you do is simply create a new shortcut to Explorer.exe. That’s the file name for Windows Explorer. If you create a shortcut that runs that, you’ll have Windows Explorer back. But if you don’t have a taskbar and a Start menu? Then maybe explorer.exe is gone. Type Ctrl+Alt+Delete to bring up the Task Manager. In the Task Manager, click on the file menu and then click on the Run option. In the resulting dialog box, type in “explorer.exe” and press OK. If you suddenly get your Start button and taskbar back, that means that explorer.exe has not been removed. It wasn’t running, but it was still on your computer. Now if, when you try and run explorer.exe, you get a message that the program was not found, then perhaps it has been removed (although I really don’t know why that would be). Type Ctrl+Alt+Delete to bring up Task Manager again, then click on File; and click on Run. This time we’re going to run the system file checker. Type in sfc /scannow. Click OK and have that run. That’s going to scan your machine for missing critical files, including Windows Explorer. This process may require that you reinsert your installation CD to be able to repair or replace the missing file. If that doesn’t do the trick, then you may need to perform what’s called a repair install of Windows, again using your original installation media. Of course the worst case scenario is a complete reinstall of Windows from scratch. But I think if you have gotten to this point, a repair install should get you Windows Explorer back without forcing you to basically erase everything that’s on your machine. And of course, I do have to throw out that one way that would be very easy to recover from this: recovering your machine from an image backup that was taken prior to whenever this started happening. An image backup basically captures the state of the machine; all of it, top to bottom. When you restore that image backup, you’re restoring your machine to that state. When this kind of thing happens, simply restoring to a backup that was taken prior to this problem coming up will immediately make the problem go away. How can I get Windows Explorer to default to open on a directory of my choosing? 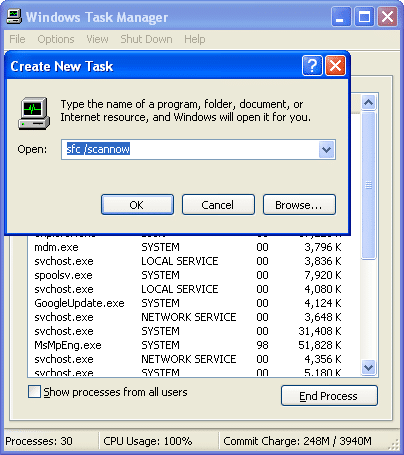 - You can create a shortcut to open Windows Explorer on the directory of your choice. Why Does Windows File Explorer Right-click Take so Long? - The menu that drops down on a right click is called a Context Menu. To fix it we need to first delve into why and how it works. « Previous post: Does visiting a search-engine cached page prevent the original site from noting my visit? If malware injected itself into explorer.exe, wouldn’t that be a possible reason an antimalware program might delete it? I’m not saying I think this might be the case here, but it seems to me this could be theoretically possible. Probably depends on the antimalware vendor. I know for sure that Microsoft products delete files completely, but a few programs out there might just clean out the file and leave it. Even so, deleted Windows files typically restore themselves immediately, but I suppose it could be circumvented, or maybe, in the above case at least, it could be because the MSRT was run during system shutdown. Also, some malware, especially some ransomwares and a few rogues, set the default shell as itself so that it runs the desktop later when it wants to, instead of it being run automatically. I have the weirdest thing happening on Win 10 Pro with windows explorer! It runs because I can see a desktop and task bar, but no file folders will open! Any shortcut or folder I click on merely results in a black screen flash and then reverts back and nothing else happens. Thanks so much- I really thought I had messed up my laptop but a huge weight has been lifted off my shoulders. Once again, thank you so much! OMFG I AM NOT INTO THIS CRAP!!! I TURNED OFF WINDOWS EXPLORER AND NOW I CANT SEE MY OPEN WINDOWS AND TASKS!!!!! OMG I CANT EVEN TURN ON TASK MANAGER!!! OMG HELP !!!!!! !